India is now an economic shining light among the five BRICS member states. For this reason, New Delhi should not leave the big stage entirely to summit host China, says DW's Alexander Freund. The BRICS summit in Xiamen in early September is a welcome occasion for the host, China, to demonstrate once again its significance and grandeur - both to a domestic audience and to the outside world - ahead of the all-important 19th Congress of the Communist Party. Delicate issues have been excluded from the agenda of the gathering, as Beijing can ill afford to have any disruptions ahead of the crucial reorganization of its political leadership. Instead, the members will probably focus on consensual topics such as free trade, climate change and cybersecurity. Last but not least, the challenges of a digitized economy - the central theme of India's BRICS presidency last year - are still on the agenda. However, the big stage and the show of unity cannot conceal the fact that China has long moved away from the basic idea of the BRICS grouping. Among other things, it is pursuing its own plans with its "Belt and Road Initiative" (BRI), and clearly intends to further expand its influence. To make matters worse, the original hopes attached to BRICS have all but evaporated; the times of the unbridled economic growth of its members are long gone. The five member countries - Brazil, Russia, India, China and South Africa - were once seen as emerging economic superpowers. It seemed only a matter of time before they would overtake their Western peers, which have struggled to reform their economies. But the euphoria about BRICS has now vanished. The boom in China's economy, which accounts for two-thirds of the entire bloc's GDP, has run out of steam, with double-digit growth rates now a thing of the past. In 2016, China's GDP growth rate was a far more modest 6.7 percent. For 2018, the Chinese economy is forecast to expand by just 6 percent. With this "controlled slowdown," Beijing wants to reconfigure its economy - to transform it into one driven by domestic demand and services rather than exports and the manufacture of cheap products. This has so far proven to be a risky maneuver, however. In addition to China's well-known excess capacities in heavy industry, highly speculative real estate boom and widespread high corporate indebtedness, the country's foreign exchange reserves are shrinking at a rapid pace. Russia appears to be in an even more dismal state: The decline in oil prices and the sanctions imposed by the West over Moscow's annexation of Crimea have hurt the economy, dragged down the value of the ruble and boosted inflationary pressures. The situation has already prompted President Vladimir Putin to start selling and privatizing state property in an attempt to funnel money into the government's empty coffers. The situation in Brazil is yet more dramatic. Politically and economically, this once great Latin-American hope is now in a state of crisis. The low oil price has also led to an economic downturn, with Brazilians consuming less and unemployment rising. Quite apart from its current political turmoil, the Brazilian government has faced financial difficulties for a while now, as the whole world witnessed during the last World Cup football tournament in 2014. The African member of BRICS, South Africa, is also struggling economically. Growth has slowed down considerably over the past five years, trade imbalance has been stubbornly high and government debt has reached a critical level. Compounding the poor economic conditions are political uncertainties and bad governance that are frightening foreign investors, whom the country needs so badly. In this context, India remains a source of hope within the BRICS club. The nation's economy is clearly on an upswing, with the International Monetary Fund (IMF) forecasting 7.6 percent expansion in this year and the next. Even the often double-digit inflation rate is now under control. India is becoming more and more interesting for foreign investors, especially as the previously closed sectors are increasingly being opened up for foreign direct investment. At the same time, growth-stymying bureaucratic hurdles are expected to be reduced further, while numerous regulations among the nation's 29 states are harmonized. All of these things raise great hopes. However, India is still faced with major challenges. At least two-thirds of the population remains excluded from the newly generated prosperity. And compared to the 1970s, the 800 million Indians living in the rural parts of the country now have much less food available. This is an untenable situation, especially for a member of the BRICS group. In the BRICS club, India quite rightly plays an important role. But if the group really wants to be more than just an acronym, it needs a strong common theme that brings together all its members. This would also be a good way to reduce the recent tensions between India and China. India should, therefore, give a greater impulse to the bloc and not leave the big stage entirely to China, which wants to expand its clout with its BRI project and other initiatives. Wherever China's claim to power conflicts with the interests of other BRICS partners and where the BRIC becomes a one-way street for expanding Chinese influence, India should also be alarmed. 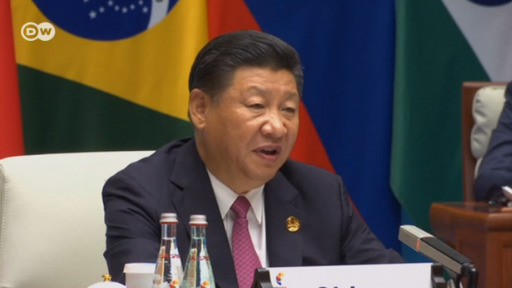 The BRICS group of emerging economies must promote free trade and an open world economy, Chinese President Xi Jinping said at the start of the three-day summit in Xiamen, China. But the meeting was overshadowed by the latest North Korean weapons tests.